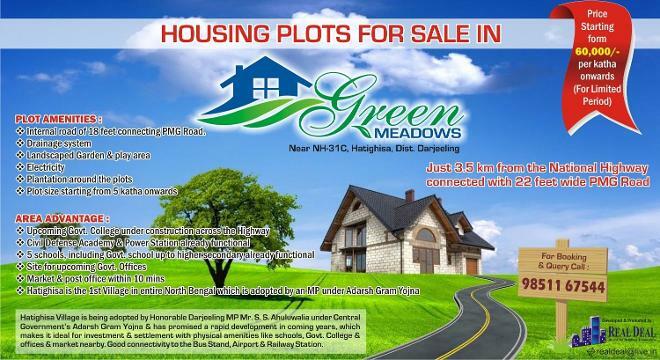 Located at hatighisa ,The plot is just 3.5 k.M from N.H-31c and is well connected with the pmg road. The plot has a scenic view of hills on the north and has an internal road of 18 feet which will connect all the plots. The market is nearby for daily amenities .There are approx 6 schools within the span of 2 km of the area and also a Govt college is under construction by the Highway. The recent adoption of the Hatighisa Village by Darjeeling M.P , Shri S.S.Ahuluwalia has made this a hot investment destination too. Ideal for residential and investment purpose. ROI in three years expected to be 200%. • Landscaped Garden & play area. • Plot size starting from 5 katha onwards.